Roofing company Metind Limited (formerly Metalcraft Industries Limited) has been fined $43,000 and ordered to pay reparations of $10,000 after an employee was seriously injured after falling more than three metres from a roof. The Auckland District Court heard that on 9 June 2011 three employees of Metind Limited were working on a single storey Keith Hay residential home in Glen Innes, Auckland. “While reaching down to secure a safe hold on the damp ridge of the roof, one of the employees slipped and fell more than three metres to the ground, fracturing his lower back, several ribs and damaging shoulder tendons and ligaments,” says the Department of Labour’s Northern General Manager John Howard. The Department of Labour’s investigation into the incident found that it could have been prevented if Metind Limited had planned a safe approach to working at height and put in place appropriate roof edge protection. “The precautions taken by the employer fell short of what is required,” Mr Howard says. “Preventing falls from height is a priority for the Department of Labour. We expect everyone with staff or contractors working at height to actively manage this significant hazard,” he says. 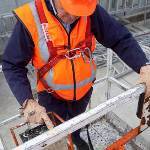 The Department’s new Best Practice Guidelines for Working at Height in New Zealand provide practical guidance about how to actively manage working at height to prevent harm.